This tutorial will show you how to make this delicate filigree gilt wire bangle with amethyst beads. The final measurements of the bangle are 23 cm x 4 cm (9 in x 1.6 in). 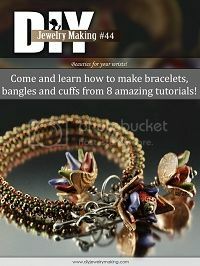 The tutorial has 27 pages, 16 steps and lots of pictures.